Ready for the snap, crackle and pop of a roaring fire? Here's everything you need to know. Fireplaces are one of the most sought-after home features, but using one can be intimidating, and you’ve probably got questions. Here’s a quick guide to get you and your fire started this fall. How do I use a wood-burning fireplace? If a cave man can start a fire, so can you. Safety is your first priority! Have your fireplace and chimney inspected by a licensed professional. This is something you should do every year, before the first fire of the season. Clean out any old ashes with a broom (make sure they’re cool, of course). Check that the damper is open and working properly. Use seasoned hardwood that has been split and dried for at least six months — preferably for a year. Seasoned hardwood logs should be dark and cracked at the ends, and they should make a hollow sound when knocked together. To construct a long-lasting fire, place a rolled-up ball of newspaper beneath the grates. Then lay pieces of narrow, finely split wood in a crisscross pattern on the grates. Finish the stack by securely resting one to three dry logs over the kindling. This step heats the cold air inside the flue so you don’t get a backup of smoke. Before you light the fire, light a tightly rolled-up sheet of newspaper, and hold it toward the open damper. Keep it there for a minute or two until you see the smoke going up the flue. Now you’re ready to light your fire and enjoy. If the fire starts to go out, gently fan the flames with folded newspaper or use a poker to get the air flowing again. Add logs to the fire with tongs to provide more fuel. When the fire has gone out for the night, close the metal or glass doors before you go to bed. It depends. Wood-burning fireplaces, for all their old-fashioned charm, are a wildly wasteful way to heat a house. Since heat rises upward, most of it escapes through the chimney, even when the fire has gone out for the night. Fireplaces located against an outside wall lose even more heat, since much of it is lost to the cold outdoor air. Solution? Only use your wood-burning fireplace for special occasions. If you don’t plan on using your fireplace often, purchase an inflatable plug to add insulation. Gas fireplaces are more efficient, and the newest models are realistic enough to make you forget that you don’t own any firewood. Switching to a gas insert is expensive, though, especially if you have to make changes to your chimney. 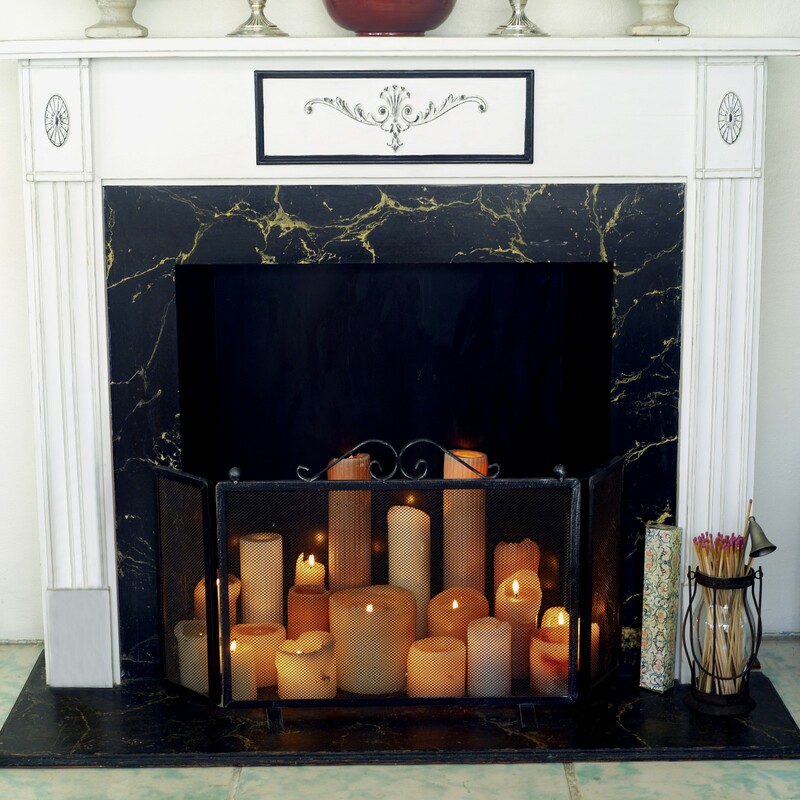 If aesthetics are all that matter, use your fireplace to display lit candles. Keep flammable materials and objects away from the fireplace, and store firewood well away from the house. To keep embers from flying out and igniting your unread stack of magazines, use a mesh or metal screen when the fire is lit. Before lighting the first fire of the season, inspect your extinguishers, test your smoke detectors and review your family’s evacuation routes. Continue to test your smoke and carbon monoxide detectors monthly. The glass doors, mesh screen and tools can be dangerously hot. If you have children, use a free-standing barrier to prevent burns. Wood-burning fireplaces produce smoke that can irritate or even damage your lungs, even with a properly functioning chimney. To keep smoke from filling your house, ensure that the damper is open, your home is ventilated, and the chimney has been inspected and cleared of obstructions. Carbon monoxide is produced by both gas and wood-burning fireplaces, and it’s especially dangerous because it’s invisible, silent and odorless. Use carbon monoxide detectors and inspect them regularly. 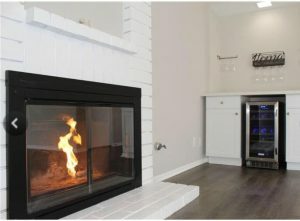 Why does my gas fireplace smell? What you smell is an additive that’s been included in the propane to help you detect gas leaks. Vent-free gas fireplaces typically come with an oxygen depletion sensor that will shut off the flame if too much carbon monoxide is detected, and vented fireplaces pull fumes away from the house. These safety measures aren’t foolproof, however, so ensure that you have carbon monoxide detectors installed, and inspect them monthly by pressing the “Test” button. A buildup of soot and creosote is more than unsightly: It can reduce airflow, cause smoke to back up and even create a fire risk. To avoid a chimney fire, have your fireplace and chimney inspected annually by a licensed professional. They will likely recommend a cleaning when the layer of residue is about 1/8 of an inch thick. To clean inside the fireplace, put on a dust mask, sweep out the ashes, and scrub the surfaces with a brush and dish washing liquid.